Order Today From Sunray’s Secure Online Store! We’ve chemically bonded a polyurethane tread to a standard ball bearing to produce a high-quality wheel that has proven to be one of the most versatile in Sunray’s product line. Due to high demand, Sunray can now ship standard Poly-Covered Bearings quickly! Sunray is pleased to announce that our Poly-Covered Bearings are now available online! Use our secure server to order your Poly-Covered Bearings and will ship them the very same day if ordered before 3:00pm EST. The more you order the greater the value! Price will be adjusted automatically for quantity discounts. If a different size is needed click here for our custom Poly-Covered Bearing Form. All stock bearings are covered in 95A Black Polyurethane. Upload Your Drawing Files Here ! Don’t See The Covered Bearing You Need? Click Here! Discounts applied in cart. Please contact us for orders over 1000. All measurements are in inches. $100.00 Minimum Order. NC, SC appropriate sales tax will be added to all orders. 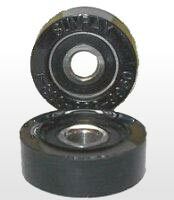 The “B” Style bearing offers extended sidewalls for extra lateral durability. Many other configurations available, including metric dimensions. Call 1-800-833-9960 for details!